The New York Times wrestles with a New Media business model. I have been reading the NY times on line edition for years. I find their articles interesting and often more comprehensive than other media counterparts, even if I don’t necessarily agree with the point of view. When I got my Android phone, I downloaded the NYT mobile application and enjoyed reading up on the latest news as time permitted. It became part of my morning routine. On March 28th, all of that will change. 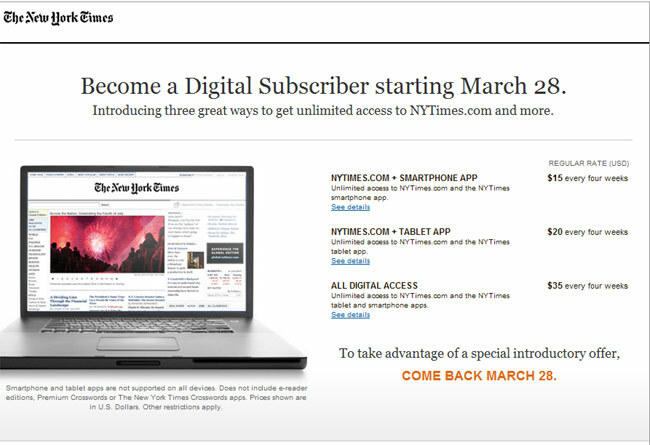 The NYT will put up a paywall, charging $15 to $35 per month for anyone going past a twenty article threshold. I have no plans to subscribe to any of these plans. I will limit my NYT reading to the twenty articles per month and then get my news elsewhere. This goes to show, once something is given away for free, it becomes very hard to charge for it later on. This is a problem that new media types, myself included, have yet to figure out; how to make money with it. This blog is a good example; I work away, trying to come up with original material or expound on other’s work from an in the trenches point of view. I have a core group of regular readers (thank you!) and quite a bit of search engine traffic just passing through. Every once in a while, I get a good link in from slash/dot, boing boing, or dig, but those are rare. Some small amounts of money are made here and there, but could I live off of this? No. It is a labor of love more than anything else. Something to keep my mind occupied while in between my children’s pickups and drop offs. This is good because otherwise a fair amount of trouble could ensue. While I empathize with the New York Times, those rates seem a bit exorbitant for an online distribution system.